If this person has made 100 jumps then they need congratulated. 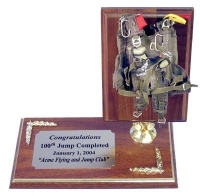 We have several style miniature parachutes that can be used. We have a large selection of mounting boards that can be used to build your display. You can add patches or medals to match the occasion.